Our eyes work like a camera, the role of the upper lens in the eyes plays the iris, cornea and the natural lenses of the eyes. Things seen by the eyes are displayed on the retina. 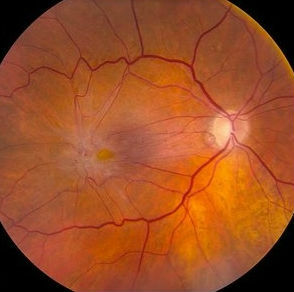 There is a macula in the middle of the retina, which helps us focus on things, but over time the vitreous gel in contact with the retina gets away from the macula, which we call posterior vitreous detachment in medical language, of which Due to the ill effects of our eyes have a bad effect on victim eyesight. The result of this is that patient start having problems in driving, writing,reading etc. Epiretinal membrane (E.R.M.) can often occur to persons 50 or older. E.R.M shows its effect on slow motion, during this time the person's vision power works normally, but as time goes on, eyesight starts weakening. Those people who are suffering from this problem begin to appear as doors, ridges, pillars, wavy and double vision.If you face these symptoms from long period immediately contact doctor and test your eyes. How Diagnosis E.R.M - To assess the severity of this disease, ocular coherence tomography (OCT) is used. How to cure - The treatment of epiretinal membranes can not be corrected by any eye drop, medicine, supplements. Treatment is vitrectomy surgery, if condition is more serious, for this, you should consult with good eye specialist and test your eyes.